Saturday morning, Kyle Roach met with Whitworth’s coaches. The senior hadn’t played particularly well on Friday, scoring six points, and hadn’t been able to find an offensive rhythm. Coach Matt Logie said he told his star player to play with more joy. Roach followed that season-low scoring output with a season-high 35 points on Saturday night, playing all but 1 minute of Whitworth’s 107-98 overtime victory over George Fox at the Fieldhouse. The victory clinched for 15th-ranked Whitworth (19-4, 11-3 NWC) the No. 2 seed in the four-team Northwest Conference Tournament, with two regular-season games remaining next weekend. Roach had just two points in the first half, in which the Pirates built a 14-5 lead before falling behind 40-33 at halftime. It was the fifth straight game Whitworth trailed at the break. But Roach, last year’s NWC Player of the Year, came alive in the second. In a back-and-forth game that saw the lead change 10 times, Roach sank eight shots that either broke a tie or flipped the lead to Whitworth. He finished 10 for 10 from the free-throw line and sank 10 of 17 field-goal attempts, including 5 of 8 from 3-point range. “When Kyle gets hot, you can’t really stop him,” said Pirates junior Jordan Lester, who had eight rebounds and six assists, both team highs. Roach’s teammates followed suit. As a team, Whitworth made 29 of 33 free-throw attempts and 12 of 28 3-pointers. The Pirates also got scoring contributions from junior Ben College (23 points) and sophomore Isaiah Hernandez (16 points), who both went 7 of 7 at the free-throw line – none bigger than College’s two with 7.9 seconds left to force overtime. Roach started overtime with back-to-back 3s – and kept going. He scored Whitworth’s first 14 points of overtime before College hit two more free throws to finish the victory. Roach also had four rebounds, three steals, an assist and just one turnover. His big night was nearly matched by George Fox senior Mason Green-Richards. He led the Bruins with 26 points on 9-of-20 shooting, and he grabbed six rebounds for the Bruins (12-11, 6-8). 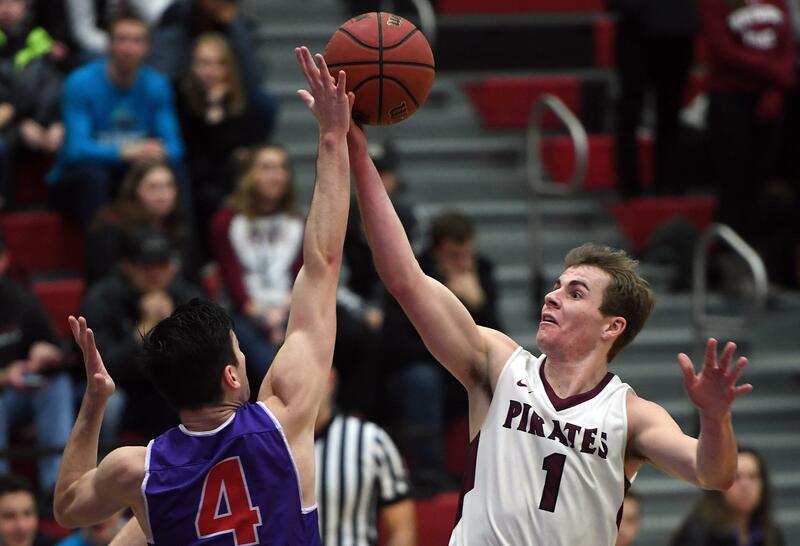 The victory was the third in a row for Whitworth, including come-from-behind victories over Lewis & Clark (Feb. 2) and Linfield (Friday), their most likely opponent in the NWC Tournament semifinals on Feb. 21. Whitman will be the No. 1 seed. Whitworth will play at Pacific Lutheran and Puget Sound next weekend to close out the regular season. Published: Feb. 9, 2019, 9:43 p.m. Updated: Feb. 9, 2019, 11:19 p.m.